Happy Saturday friends. My apologies for missing in action again. Last week, I lost my internet for more than a day and a half, and then Tucker, my little fur baby got sick with what appears to be a stomach bug of some sort...or he managed to get into something without my knowing that he should not have, but he's certainly has had his mamma worried and doting over him that's for sure. 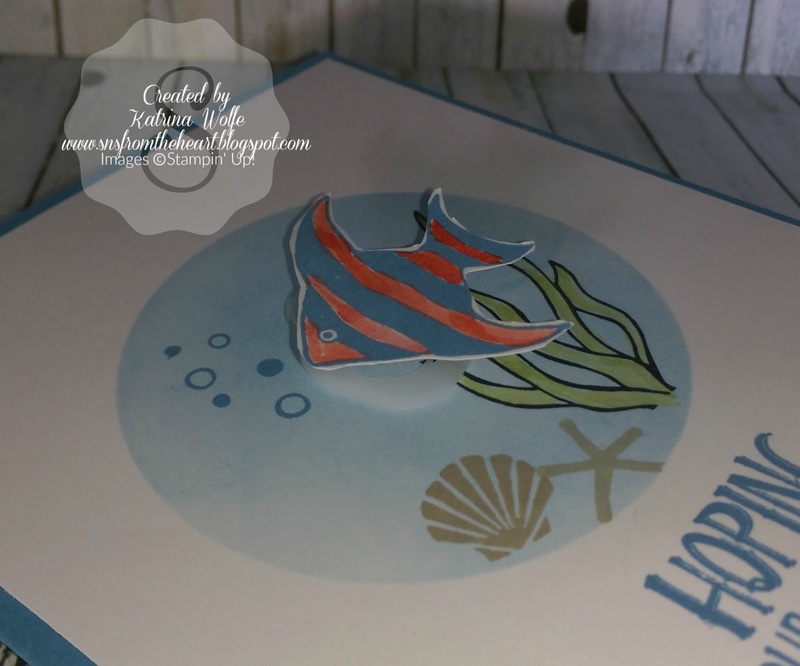 Anyway, I want to share a cute card with you that I made the other day using the ever adorable set, Seaside Shore. I love this stamp set. It's just so stinkin' cute. So what do you think? I just love this little fish. 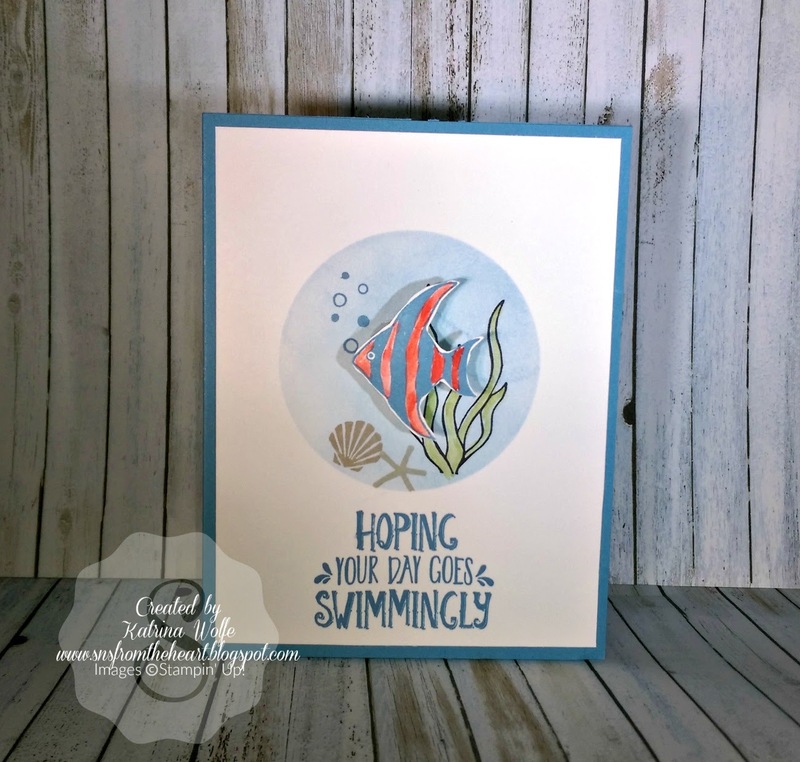 To create this card, I did a little masking to create the round focal area for my scenery, using Marina Mist ink and a sponge. 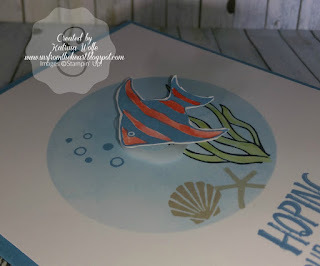 I stamped the seashell and the star fish using Sahara Sand and the sea grass with Archival Black ink and watercolored with Wild Wasabi using my Aqua painter, I stamped and colored the bubbles with Marina Mist. On a piece of scrap Whisper White, I stamped the fish with Marina Mist and filled in with Calypso Coral using the Aqua painter and fussy cut him out. Then to adhere him to the card, I used a mini action Wobbler. These are so fun. They add an interactive feature to your card. In this case, the little fish bounces around. Finally, I stamped the sentiment in Marina Mist and adhered the panel to the Marina Mist card base. This was a quick and fun card to make and I hope you enjoyed it. Be sure to stop by again for more inspiration and fun ideas. Please let me know what you think, I would love to know. Leave comments below, I read everyone of them and reply. Have a great day and Happy Stamping! Paper Pumpkin - You Won't Want to Miss This!